How cute are these rhubarb flower thank you notes!? Whitney, (a super cute senior at Texas Tech) is offering these hand made beauties to one lucky reader. Visit Whitney Rae Paper & come back to let me know what you love most. Good luck & a huge thank you to Whitney!! I just "hearted" her shop! I love the Chevron Initial cards, the thank you's offered are so beautiful as well!! I have a new giveaway on my site! I think the cards with the little bikes on them are too cute!! I'd love to win the above ones!! =) I'm going to need thank you notes!! I'm a follower of Wild & Precious!! I just tweeted from @melsrandomness!! Oooh - several cute options! I love the Double Initial thank you cards - just what I've been looking for to use as our wedding thank yous! I'm a follower of Wild & Precious! I love the au revoir card, I'm a sucker for anything made of maps. I follow Wild&Precious in google reader. oh my gooness how frickin cute is she!? I love them alllll but have my eye on the Bunting Birthday Cards!! this is such cute stationary! cute shop!! i like the bunting birthday card best - so adorable! I thought the note card with the little bikes were too cute. I am following YOUR blog. (another wonderful place to visit! I love the map envelopes! Super cool she's still in school. Also, I'm a follower of your blog. The map 4 bar envelopes are most awesome. thanks for the tweet phrasing! I am following you at GFC at this address! I am following Whitney's blog! if i had to choose just ONE, it'd have to be the map 4 bar envelopes - so cute and fun! whitney rae is now a favorite on etsy - thanks for putting her awesome stuff in the spotlight. I adore the Bicycle cards- they would be perfect for my friend who owns a bike shop. I love the look of the Custom Wrap Around Address Labels! Genius! I love the map 4 bar envelopes. I love the map envelopes! So cool! I like the bicycle cards. My favorite design is the Rhubarb Flower Thank you design that you are giving away! I like the Mr and Mrs card - would be cute for a wedding. I love Whitney's kraft chevron initial cards. So cute! I like the Multiple Thanks Cards most. I like the Bunting Birthday Card. What a great giveaway :) I would like to participate in it. Anw i am your follower through Google Friend Connect. I am http://whitneyrweir.blogspot.com/ follower through Google Friend Connect. I love the yellow flower thank you cards! I love Bunting Birthday Card. ooh!!! my favorite is her double initial cards. i'm a follower of wild and precious. i'm a follower of whitney's blog. such cute stuff, I love it all but especially the "I love us" card! I added WhitneyRae as a favorite! 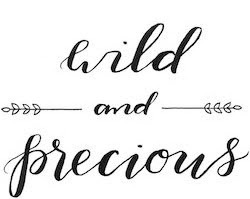 I'm a new follower to wild & precious! I love the map envelopes. Such an original idea! I loved these!! http://www.etsy.com/listing/52491742/kraft-chevron-thank-you-cards-set-of-4 Very fun! I LOVE the au revoir cards — beautiful and simple! I love the Multiple Thanks Cards! I love the Multiple Thanks Cards. Aw! Too cute. I like the Chevron cards and the Map Envelopes! I absolutely love her cards, especially the Rhubarb AND Multiple Thank You cards - they are simplistic but elegant in design! Thank you for this great opportunity! I just hearted Whitney's store on Etsy! I love the White Chevron Inital Cards. The map envelopes are so cool!! I added WhitneyRae as a favorite on Etsy. I am a new follower of Whitney's blog! I like the "from the desk of" cards. They're super cute! I love the White Chevron Inital Cards! I love the "From the desk of..." notepad. I'd get it personalized for my classroom, "From the desk of Ms. Reynolds." So cute! What a great giveaway- thanks! I love the From the Desk of Notecards (Set of 8)- personalized stationery is the best! Great cards! 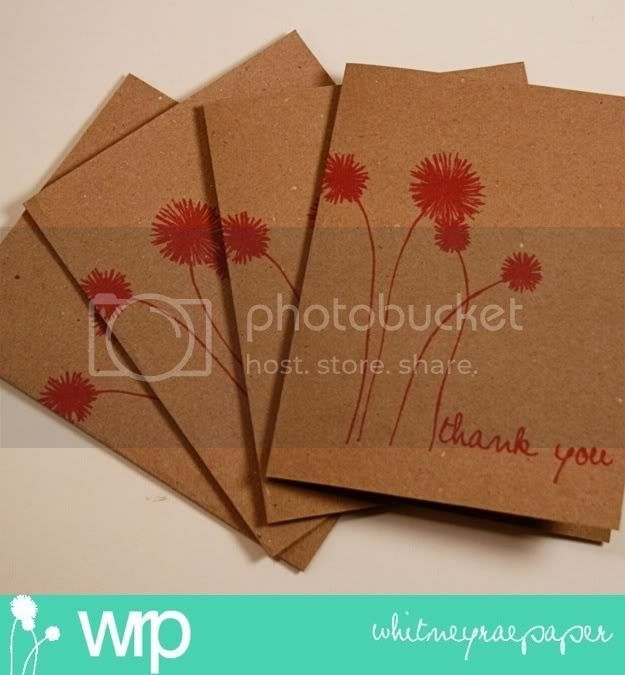 I also like the Yellow Flower Thank You Cards. Thanks! I adore the map envelopes! Those are the best ever! I could just envision myself mailing my clients letters and such in those envelopes! is a love of mine! Added her to my fave on etsy! I like the Multiple Thanks Cards (Set of 4). I love the kraft chevron initial cards! I added your giveaway to my post! Thanks for letting me know. I can't believe I almost missed this! SO cute. And I love her Map 4 Bar Envelopes (Set of 10). Love them. Added her as a fave on etsy. I like the white chevron initial cards. This is such a darling card! I hearted whitneyraepaper on etsy as JennyBolech! I follow whitney’s blog on GFC as Jenny Bolech! I love the kraft chevron initial cards. I value your thoughts/encouragement/feedback. Thanks so much for taking the time to leave a comment.